The FDA this month put into effect its “Reportable Food Registry,” which essentially gives food & beverage manufacturers 24 hours to report a food safety issue that they think will harm people or animals. “The U.S. Food and Drug Administration has a new way to head off potential cases of foodborne illness – the Reportable Food Registry (http://rfr.fda.gov/), where food industry officials must use to alert the FDA quickly, through an electronic portal, when they find their products might sicken or kill people or animals,” the agency announced on Sept. 8. Facilities that manufacture, process or hold food for consumption in the U.S. now must tell the FDA within 24 hours if they find a reasonable probability that an article of food will cause severe health problems or death to a person or an animal. The reporting requirement applies to all foods and animal feed regulated by the FDA, except infant formula and dietary supplements, which are covered by other regulatory requirements. 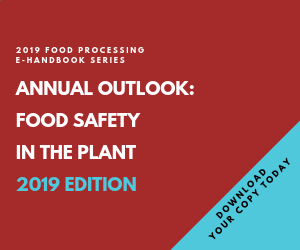 Some examples of reasons a food may be reportable include bacterial contamination, allergen mislabeling or elevated levels of certain chemical components. 3. Work with the FDA to follow up as needed. A responsible party is not required to report if it found the problem before the food was shipped, and corrected the problem or destroyed the food. More information is available at www.fda.gov/ReportableFoodRegistry or you can visit the portal itself: www.fda.gov/Food/FoodSafety/FoodSafetyPrograms/RFR/default.htm.